Specially designed for use with mineral spirits, turpentine and other solvents the Airtight Brush Washer features a double latching lid that locks securely, forming an airtight seal so there is no spilling, evaporation or odors. A removable strainer cup lets sediment collect in the bottom. Convenient for travel, the bucket style handle makes it easy to carry or hang and holds 8 ounces. 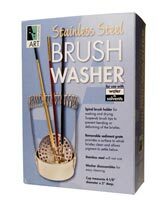 The Stainless Steel Brush Washer is a great compliment for any art sets that features a spiral holder which suspends brush tips to prevent bending or deforming of the bristles as they hang to dry or soak in either water or solvents. A removable sediment grate provides a surface to whisk bristles clean and allows pigment to settle below. The cup measures 4-1/8" diameter x 2" deep. Both washers disassemble for easy cleaning and will not rust!